Confession: I love bread. Of any kind, really. But it doesn’t love me. With all the carbs and sugar, I might as well just glue it to my waist and pretend it’s a fluffy accessory. It was my stubborn love of banana bread that has pushed me to find a healthy and tasty recipe for it. So I’m happy to announce that I have made a healthier banana bread! Well… me and my middle child who, after lots of practice running the stand mixer and helping me loaf after loaf, can pretty much make banana bread without me. The banana bread recipes I’m been trying substitute the “bad” ingredients for ones like yogurt, honey, applesauce, or coconut oil. But the results have been dry tasteless loaves that have no resemblance to the sweet banana-y flavor of “the real thing”… you know, the kind made with shortening and a whole cup of sugar. And that’s where it gets me: the sugar. Why so much when a natural sweetener can do the same thing… naturally? After several concoctions and blah attempts, Dylan and I finally came up with the perfect ingredients to make a healthier and tasty banana bread! My hubby likes his bread a little denser so this was perfect for his preference with all the flavor I was hoping for! Mix the applesauce and honey until well blended. Combine the remaining ingredients to mixture. Bake at 350-degrees for 50 minutes. Pair your banana bread with eggs, yogurt and/or fruit and you’ve got a complete breakfast. Happy eating! I hope you liked it, Kristin! We just made 2 loaves yesterday! So good! I can’t wait to try this! 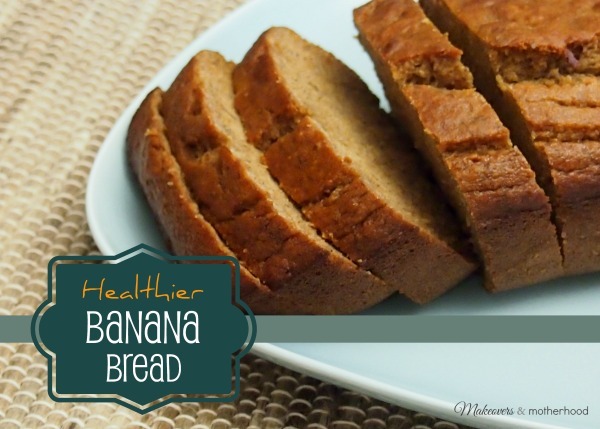 I love banana bread and it sounds great!